When you think of war you think shrapnel, smoke and the stench of fear. You think of foreign lands covered in debris and cloaked in confusion and destruction. You think of an enemy that is maniacal, twisted and relentless. What you don’t think is that the landscape of war could be your own soul and the enemy your own thoughts, but as I turn another year older I realize that I have been waging war against myself and it’s time to declare ‘the war is over’. As I’ve been praying and pondering about the years that have passed and the one that is to come I can’t help but think of the stress and turmoil within my own soul that have been my constant companions. From the day I was born the enemy of every soul was perched and waiting for the opportunity to destroy me. He began by trying to steal my life before it had even begun – I was breach with the cord wrapped around my neck – and when that failed he went in for destroying the life that was yet to come. After my mother woke up, I was brought to her for the very first time. When she saw me she declared that I wasn’t hers, they’d made a mistake, send me back. Those words were the open door the enemy needed to begin a lifelong, relentless attack. Please know, I am fully aware that my mother didn’t really mean what she said (heavy meds make you do strange things) she has loved me and fought for me my entire life. Yet after hearing the story over and over my tender heart, unsure of who I was or whose I was allowed the seeds of rejection, shame and fear to take root. These feelings were only magnified by bullying and persistent teasing both at home and at school. Even when I was alone, away from the external voices that ridiculed me, I continued the barrage of hate in my own mind. 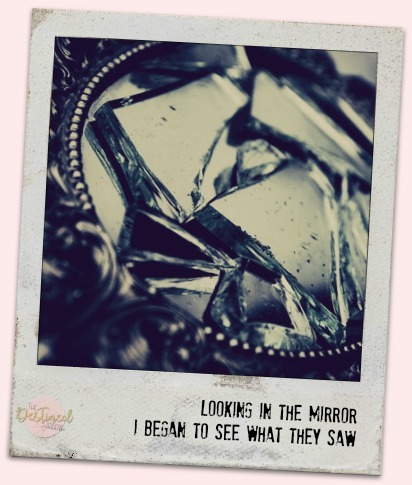 I would replay the voices and looking in the mirror I began to see what they saw. Slowly, I came into agreement with the disgust and shame convinced that their words were truth. Their words became my words and their perception became my reality. Now I sit here decades later weary and frustrated. It seems every tactic I’ve used has only led to stress, frustration and failure. I’m not the girl I once was but I’m not the woman I desire to be. I still battle the need to apologize for who I am, the desire to be someone else and the frustration of knowing that I’m wasting time and energy trying to fix something that I am incapable of healing. So now what? The war is over. I’m waving the white flag. It’s time to have a sit down at the table of decision and draft the conditions of a peace treaty. It’s time to lay down the weapons of hatred, fear and disappointment, take a deep breath and rest. Yes, rest. I feel God calling me to rest. This is new territory for me, I don’t recall ever not judging myself, trying to prove myself or really accepting myself. The chatter in my brain is filled with ‘what I need to do, what I didn’t do, how I failed (and looked while doing it), how I could’ve done it better’. And as if that wasn’t enough I even take on the task of deciding how others perceive me, think about me and feel about me. Rolling around in my head are my own judgmental thoughts of myself accompanied by what I imagine others think of me. Yes, the battle ground is crowded, messy and loud, so very loud. The idea of rest seems so inviting, Pinteresty and foreign- I want to go there, but if I do then who will take on the full-time job of scrutinizing every detail of my life and making the call of whether or not I’m good enough? Who will constantly point out where my reality looks nothing like my dreams? Who will apologize for my being me? 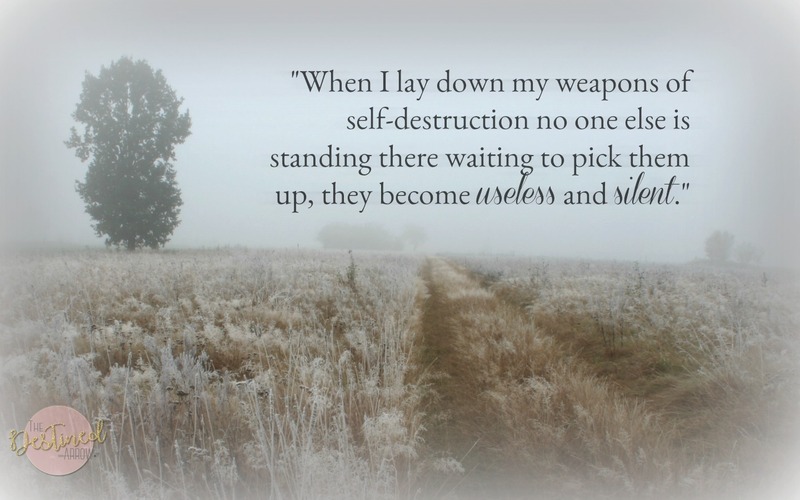 And now I see the point; when I lay down my weapons of self-destruction no one else is standing there waiting to pick them up, they become useless and silent. I am the only one who knows the code to the nuclear bomb in my head. Others may taunt me and provoke me in an attempt to get me to hit launch but their power is only as strong as I allow them to be. I have the power, not them. And by ‘them’ I mean anyone who has ever made me feel like I should be ashamed of me – those who think I’m unattractive, those who think I pray too loud or talk too much, those who think I make bad decisions, those who think I dream too big, those who think they know… there are a lot of those. I’m turning my back on all of them – the naysayers, the criticizers, the judgement givers. I’m laying down my weapons – shame, self-loathing, hatred, fear. I’m walking away. The war-torn ravages of my heart need to heal and the number one prescription for healing is rest. I’m choosing to accept my short-comings, my failures and mistakes and instead of condemning myself I choose to offer myself grace. I will extend the same kindness to myself that I would offer to my own child. I will be patient with the process and remember that healing takes time. I will choose to believe that others think kindly of me – if they don’t, I won’t know nor should I care. I will walk away from the past choosing to learn and grow from it but not be held captive by it. I will stop violently assaulting myself in my mind. I will treat others with grace and kindness recognizing the signs of being war-weary and knowing that their treatment of me is not a reflection of who I am but the battle within their own heart. Life is all about choices, this is not a new concept. However, intentional, grace-laced decision making is a new practice for me. This is the beginning of a new chapter, a new era. Not a new me – just a well-rested and accepted me.